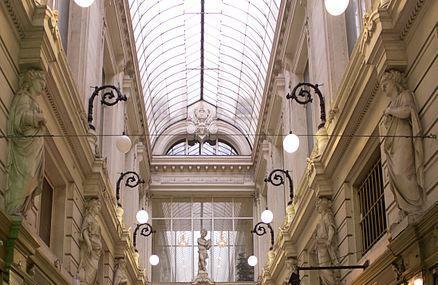 Between the 1820s and 1860s Brussels built shopping arcades in a flurry, ten of them. This is Eclectic-style arcade of the only three to have survived to today. It’s unnecessarily pretty for a shopping arcade though. The vaulted glass ceiling of the six story structure is beautiful. The interior is bright and clean. But what’s unique to these arcade are the 32 caryatids, allusory sculptures, on the walls. They are all the works of by Joseph Bertheux. They allude to a diverse range of cultures - metallurgy, commerce, astronomy, architecture, recreation, meditation and the arts. There are only 20 shops here today. These include stores for jewellery, phones, an optician, a florist, perfumerie, an oyster bar, a barber and a chocolatier. The shops keep their own hours. The shops timing are 9.30 am to 6.30 pm. How popular is Passage Du Nord? People normally also visit Manneken Pis while planning their trip to Passage Du Nord. Nice place to be in. Posh shops. Great place to have a drink in a historic place in Brussels.